THEY wandered off the beaten track to become not just musicians, not just businessmen, but a fulfilling combination of both. Mr Peng Chi Sheng and Mr Aaron Lim, both 37, founded Intune Music School in 2007. With just $10,000 in start-up capital, a small room in Lavender Street and a handful of students, the two men embarked on their mission to inspire in students a love for the craft of music. "We wanted to create something different from other music schools. Here, we have something instructional that we can share with others. A scientific approach to something artistic," Mr Peng said. The journey was not easy even after they moved to larger premises, a shophouse in Prinsep Street. "During the monsoon season, we used to be surrounded by buckets of rainwater and above us was a roof that was beginning to cave in," Mr Lim said. "On rainy nights, I used to wake up and think about the school," he said, laughing. Intune Music School now operates in drier premises at PoMo shopping centre in Selegie Rd. Through a combination of online marketing, word-of-mouth recommendations and aid from the Productivity and Innovation Credit (PIC) scheme, it has grown and now has more than 100 students. The school, which has 15 other instructors, brings in annual revenue of $700,000 to $800,000. Its syllabus is targeted at vocal production and "nurturing your own sound", rather than imitation, said Mr Lim. "We approach singing from inside out. We first work on developing the muscular exercises and understanding how sound is produced," Mr Lim said. He added that he trains all the school's pop-singing instructors to teach in a certain way. Intune Music School is also known for offering courses in opera and broadway singing, specialities usually offered only at institutions for serious learners. It set up a publishing arm in 2012. In the first few years, they helped compose songs mostly for charity purposes. They include the 2013 theme songs for the Pink Ribbon Walk and Project Happy Feet Slipper Race. They have around 10 students taking songwriting classes. The school supports students in their publishing endeavours. 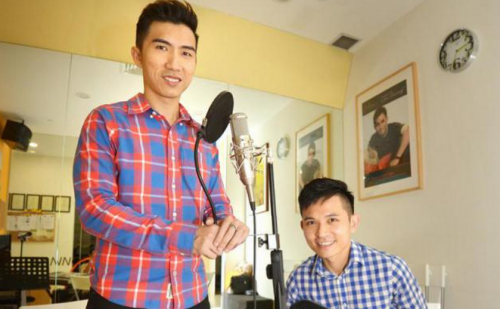 "Sometimes, we help students to contribute their songs to get some exposure," Mr Lim said. Mr Peng added that they try to give students "adequate support from the media", such as media links and contacts. The teachers also monitor their students' development of original works during classes. "Half of the vocal teachers here are singer-songwriters themselves, and hence are able to identify potential talent," Mr Peng said. Children may not have an extensive vocabulary, but they are very expressive, he said. "For instance, a student of ours is only six years old, but the other day she was creating fruit songs of watermelons. "There needs to be an environment for children to create original works and it has to start from young," Mr Peng commented. As part of such efforts, Intune Music School works with the Ministry of Education to conduct lyric-writing and music workshops at schools. The idea of creation and intellectual property (IP) is important to the two directors. "IP is important as a form of branding," Mr Peng said. It is also important with regard to how you want to position your company within the industry, added Mr Lim. Together with Compass, an organisation which helps songwriters and music publishers administer the rights to their musical works, Intune Music School also conducts schoolyard assemblies to educate students on the importance of respecting IP. "With greater respect, more will enter the creative industry, leading to more original works," Mr Peng said. The pair are quick to note that they are both musicians and businessmen, and this has influenced their perspective with regard to Intune Music School. "It is very difficult for musicians to be business owners and manage the overhead costs," Mr Peng mused. "It takes a lot of guts and determination. "Sometimes we are caught in a dilemma - whether to listen to our business or artistic side," said Mr Lim. Things like album production involve a huge investment with no fixed rate of return, they said. "But while it is good to earn money, we are still artists who love our craft," Mr Peng said. "We take pride in carrying out good performances and this is where our satisfaction lies." The duo plan to foster deeper relationships with their staff and making more music. "We are musicians turned entrepreneurs. We want to leave behind a legacy that inspires," Mr Peng said. "That is the point of setting up this music school."